Shimla is the one of the best hill station in India. Shimla has a population of 1.7 lakhs.In Shimla, you can go for a nature walk, go fishing, golfing, ice-skating, trekking, skiing, adventure sports and much more. The major places to visit for trekking and adventure are Fagu, Kufri and Naldhera. Kufri is a ski resort for winter's only. If you are in the mood to take on a game of golf, you can pay a visit to the Nalendra Golf Club which is 22km away from Shimla. Shimla is very beautiful. In Shimla most of the people come to see snowfall. The people in Shimla are very innocent and honest. Shimla is also called Queen of Hills. 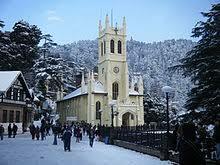 Shimla is on the south-western ranges of the Himalayas. The city stretches nearly 9.2 kilometres (5.7 mi) from east to west. Local transport in Shimla is by bus or private vehicles. Buses ply frequently on the circular road surrounding the city centre. Like any other growing city, Shimla is also expanding with new habitats in the vicinity.Transport services in these areas are also expanding rapidly. Shimla is well-connected by road network to all major cities in north India and to all major towns and district headquarters within the state. At last I want to say that Shimla is Queen of Hills it is a living heaven on earth.